Photo found on Flickr.com courtesy of Canton Public Library (MI). Many different communities offer recycling programs. To find out about your local recycling options, the first place to look is your town’s website. If the website doesn’t exist or if there’s no information on recycling, try your local library or community center. Many cities have programs to recycle aluminum, paper, and certain types of plastic. These are some of the most profitable materials to recycle. Well-run programs can even turn a profit, and donating to civic recycling programs does more than reduce landfill use. Sorting aluminum cans and old newspapers may even keep taxes low by funding city services! Photo courtesy of georgehotelling at Flickr.com. If you want to make sure that your recycling helps local programs, you can also recycle your waste paper to fund education. Abitibi Paper Retriever operates several hundred paper recycling dumpsters in the US, Canada, and the UK. The company provides the dumpsters free of charge at many schools and pays a bounty on all recycled paper. If you have an old TV, computer, MP3 player, or other electronic device, that type of trash is especially important to recycle. Some cities offer special recycling services for hazardous materials. This is because electronic trash (also known as e-waste) contains all sorts of toxic chemicals and heavy metals, including PCBs, lead, and arsenic. When e-waste is dumped in the landfill or burned in an incinerator, some of those toxic compounds can get loose. They find their way into the air that we breathe, the water we drink, and the crops we eat. Over time, they accumulate in our bodies and can cause significant damage. 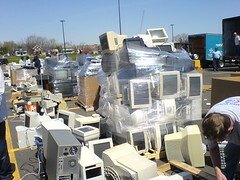 E-waste recycling programs often charge a disposal fee for certain items. For example, you can expect to pay at least $5 per TV monitor to safely dispose of the lead in it’s Cathode Ray Tube. If you find someone in your area who offers to recycle e-waste (especially if they offer to do so for free), do your homework and find out what they do with the waste. …open burning, acid baths and toxic dumping pour pollution into the land, air and water. Here’s where you can find a certified e-waste recycling center. You may want to consider one of these organizations which are committed to safe recycling.